Paul Shambroom has spent the greater part of the past eleven years creating two series of photographs, both of which document specific, uniquely American manifestations of political action. The first, Nuclear Weapons (1992-2001), presents the highest and most hidden levels of power in the United States by documenting the U.S. strategic nuclear arsenal. The second,Meetings (1996 - present), is a study of grass-roots democracy in action—elected civic leaders interacting at municipal and community meetings throughout the United States. These two series, though seemingly at separate ends of an abstract spectrum of power, reveal, when considered together, the importance of informed, active individuals in the functioning of a vital democracy. Today, 182 years and many generations after Democracy in America, the Union has turned out to be a superpower unlike any other in history. The extreme and dominant influence of the United States in world politics today is partly the result of over fifty years of nuclear-arms development, deployment, and accumulation. This type of power comes with a price: since 1945 we have lived with the psychological burden of the knowledge that humanity possesses the nuclear capacity to annihilate the world many times over. After the break-up of the Soviet Union there was a general belief that nuclear weapons were being dismantled on both sides, as they were no longer needed. But Shambroom’s pictures make our hidden and proliferating arsenal real for himself and for others. Shambroom’s fascination with power structures began with two early photographic projects in which he documented factories throughout the United States, as well as corporate offices and police stations in his hometown of Minneapolis/St. Paul. As an extension of this work, he decided to pursue photographing nuclear weapons. It was the early 1990s, the Soviet Union had collapsed, the Cold War was officially ended, and Shambroom figured his chances of gaining access to previously restricted nuclear sites had improved. He was right; as a U.S. citizen it was his right to visit these places. But it would not be at all easy. It took him over two years of relentless letter-writing and phone-calling to overcome bureaucratic barriers and government inertia and gain access to his first site. Once permission was granted, Shambroom had to work under complicated circumstances. He was often “escorted” and occasionally his film was developed by military personnel and reviewed before being released to him. Schedules were inflexible and particular details were often off-limits. At one site he was required to use an Air Force-issued camera. He set up his shots, measured the light, and then a military technician released the shutter for him. In spite of these restrictions, for nine years he was able to document numerous Peacekeeper missiles, B-2 Stealth bombers, command and control centers, and Trident submarines. People, if seen at all, are typically busy cleaning, repairing, transporting, and guarding the weapons and their storage units. Often dwarfed by the sheer mass of the machines, people appear as fragments, often cut almost completely out of the picture, or a blur of motion in an otherwise clinical setting. In one image an Air Force technician sweeps the floor around a long row of nuclear gravity bombs, each with the capacity to destroy a major city. In other images, it is only the details of personal effects that indicate human presence. A Poseidon submarine officer’s pillowcases depicts his family members in photo-transfers with the words “we love you.” Search-A-Word puzzles and Easyriders magazines litter a Trident submarine’s crew quarters. We are reminded that it is regular men and women who stand between us and a nuclear holocaust, and that it is human beings who create these weapons and are in charge of their maintenance and safekeeping. In one image of a vacant control center, empty chairs around a table disconcertingly leave the question of who’s in charge unanswered. There is a contradiction in the pictures between the controlled formality and serenity of the spaces —emphasized by Shambroom’s precise control of light and composition—and the insidious, invisible threat of the weapons of mass destruction that they contain. Burdened by the same oddly inappropriate beauty that haunts many pictures of war and violence, these pictures reflect Shambroom’s own experience of photographing the weapons as one of simultaneous horror and fascination. There is a tension between the visual seduction of sleek technology and the function of these objects that we often choose to ignore. Although Shambroom has vivid memories of “duck and cover” drills, the Cuban Missile Crisis, and a nightmare he once had as a child about nuclear Armageddon, he says that “in spite of these strong childhood memories I was not obsessed with daily thoughts of the bomb, nor was anyone else I knew. It was just part of our world, disturbing and sinister but unseen, remote, and ultimately unthinkable.” The photographs are presented as large-scale color prints mounted onto acrylic, their shiny appearance mirroring the immaculate environments they depict. Shambroom continued the project until the terrorist attacks of September 11, 2001 shut his door of access to all military installations. 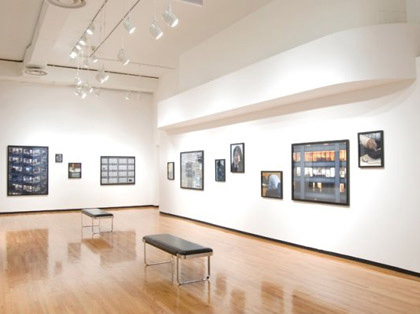 In his article “Blasted Allegory,” art historian and curator Timothy Druckrey writes, “In the nuclear age, image-makers face a tremendous challenge: to present not the visible but the invisible.” Nuclear arms have been a passionately felt theme of many photographers in post-war America, including Carole Gallagher, Peter Goin, Richard Misrach, and Patrick Nagatani, all with varying agendas. Shambroom’s work shares its closest correspondence to Robert Del Tredici’s At Work in the Fields of the Bomb, published in 1987, that documented the U.S. nuclear arsenal and its effects, mostly from outside the gates and in the airspace above the sites. Critically, these artists remove one layer of the secrecy that has been a hallmark of the nuclear arms race, and in the process create photographs that epitomize the potential for art to offer a unique insight that can heighten or resonate with one’s own consciousness. Shambroom has often observed viewers of his nuclear photographs reacting with horror and anger, and is intrigued by people’s inclination to deny any sense of ownership for what their democratic system has produced. As a sort of antidote to this disassociation from federal process, he began his Meetings project, in which he investigates power manifested in face-to-face meetings of small municipal government and community groups. To create this series, he compiled a database of over 15,000 meeting dates, times, and locations in small towns and communities throughout the United States. He planned his excursions by sorting on statistics such as “second Tuesday of the month, population less than 5,000, southern Indiana,” and then charted his course using mapping software. Shambroom has photographed over 150 meetings in 35 states over the past seven years. He likens the experience to that of visiting many different families, each with its distinct character, organization, and points of tension. Once at the meeting Shambroom is typically met with a group that is somewhat perplexed as to his intentions but nonetheless flattered by his presence. As the participants thrash out issues such as garbage pick-up, the allocation of speeding ticket revenue, or a neighbor who hasn’t kept up with his lawn-mowing, Shambroom sets up for an eye-level, centered composition and waits for a lull in the proceedings in order to render the sharpest possible image. Consequently, his pictures do not record moments of high drama or animated expression, but rather serious contemplation, and in some cases, inattention. Using digital technology, Shambroom scans his negatives and then selectively softens and sharpens details, and adjusts luminosity to separate foreground and background elements, much as a painter would. In spite of these formal adjustments, and out of a desire to preserve his pictures’ integrity as documents, Shambroom will not alter or replace what he considers to be key factual elements such as expression, identity, or even the color of clothing. His final large-format images are printed by inkjet onto canvas and varnished, extending their painterly appearance. This mixing of painterly and photographic elements has a double effect. On one hand it relieves the burden photographs carry of being assumed to depict documentary “truth.” On the other it signals that the proceedings are historical and important, and worthy of respect. 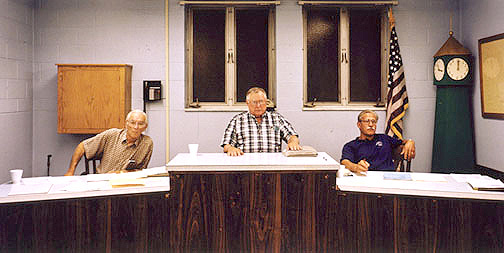 Shambroom creates a series of images that, although different in their details, capture the common seriousness and dedication of the meeting’s participants to the processes of local government. Ultimately these photographs illustrate that in our highly automated and technocratic society, individuals and small groups still play a critical role by making decisions within the seemingly “anonymous” superstructure. Face-to-face contact between small groups, in fact, is the primary forum for action, ranging from the smallest municipal meeting all the way to the President’s Security Council. Even though we have no access to this latter discussion, we are still held responsible for and strongly affected by what is decided. As far as they exist as documents, Paul Shambroom’s photographs provide us with visual access to restricted, out-of-the-way places. Like an anthropologist, Shambroom describes social space, and signals cultural meanings through his artwork. Although it is tempting to reduce the poles of power represented in the two series into binary oppositions of anonymity/specificity, abstract/specific, and powerful/weak, these are overly simplified readings. Shambroom is not trying to polarize, and his photographs do not gloomily present a noxious superstructure of authority suppressing the helpless individual from above. Rather, he questions the illusion of hierarchies of power, and ultimately posits a more optimistic possibility: that power and responsibility exists in the individual, whether within, in spite of, or parallel to totalizing discourses. In this respect, Shambroom’s work can be read as a provocative call for personal and collective change.